Here are some of the questions and search terms that frequently bring people to this blog. If you have a question that’s not here, feel free to leave a comment! Blue and Gold macaws like this boy hail from South America. Lutino Indian Ringneck Parrots are native to India. White-bellied Caique. Like macaws, these birds are from South America. Moluccan Cockatoos originate from Seram, the largest island of the Moluccas, Indonesia. Senegal Parrots are from Africa, while parrotlets (like Ptak, the blue bird in the cage) are from Ecuador. No! Any cockatoo is one of the worst ‘first’ birds you could consider. I’ve written an article called ‘Concerning Cockatoos‘ that explains more, and it’s also worthwhile to consult mytoos.com. These birds are not only beautiful, they are complex and dangerous. A cockatoo large or small is not a bird for a family with children, or truly for anyone other than a trainer or owner with extensive experience. ‘Parrots for beginners’ (or ‘big parrots for beginners’). Answering with complete honesty, no. Whilst they are loving, beautiful, intelligent creatures, their complexity brings so many challenges and a lot of stress. If you are willing to give a home to a parrot, and are prepared to deal with screaming, biting, and possibly plucking, plus the myriad of demands entailed in ownership, please do! Know, however, that they are demanding creatures that will take up all of your time and energy. I love my flock, but I keep them with the knowledge that they aren’t meant to be pets. No birds are domesticated at this point. It will be many generations and hundreds more of years of breeding before they reach that point. There is no such thing as a truly tame parrot – as these creatures are driven by instinct. Some individuals are more laid back than others, but all birds can and will bite. That’s all of them, I’m afraid. There are birds that sound relatively quiet in comparison to say, an Umbrella Cockatoo’s scream,, but every bird has the potential to make some ear-splitting noise. Here’s an article I wrote on both healthy and unhealthy vocalisations, plus how to cope with a screaming pet bird. Included is a video example of happily calling parrots. This is animal abuse. Besides being incredibly vulnerable animals (their bones are hollow), a parrot has no concept of right or wrong, and has no idea why you would hurt it. Instead of making the connection that ‘such and such’ was wrong, it will view you as a threat – and react more violently and more negatively in the future. Thus, your bond is severely damaged and the bird will be hesitant to trust you ever again. Why would it want to be near someone who could and would hurt it? The relationship between human and parrot should be considered as equals, not dominant and submissive roles. No. Once again, your pet has no concept of right or wrong, and will instead begin to see you as someone who can hurt it. A threat. Once this happens, trust is hard to gain back. The way to deal with behavioural issues is to turn your back calmly and ignore, or if ignoring isn’t possible, to give as little a reaction as possible. Don’t scream, shout, say no, pull away, tap its beak, gesture violently, spray the bird, cover it, or hit it. Just silence and turned backs. This is how a bird in a wild flock would react. Screaming or saying anything at all – even a quiet no – acts as a reward for a parrot. And spraying is bad because you need your bird to associate water with baths and good things for optimum health. Here’s more on reacting to a biting or misbehaving parrot. As with any creature, the individual decides. A parrot will tell you via its body language if you are too close or it is uncomfortable. As a reference, our cockatiel, Mishka, will flatten her crest in warning if we are anywhere in a five-foot radius. Mavi is unhappy when my boyfriend gets within a few inches of him, and will raise his wings, puff up, and imitate a car alarm. And Ptak will allow just about anyone near him. I’ve learnt recently that cuttlefish does nothing for a bird – so whilst many enjoy nibbling away at one, it’s best to make sure he gets the right amount of vitamins from his diet (fruits and veggies). Another option – after consulting your vet – is to choose a brand of vitamins for your pet’s water. Combined with direct sunlight from the outdoors, or an indoors UV bird lamp, this just means that your bird will get the nutrition it needs. Not only do a rescue’s fees support the costs of running the organisation (such as housing the animals or vet care), payment ensures that the animal is going to a dedicated home. Someone who isn’t invested in the process – or who just wants a ‘cheap’ bird – won’t splash down £200 or so without some consideration. I cover that in-depth in this article on my blog. The quick answer? 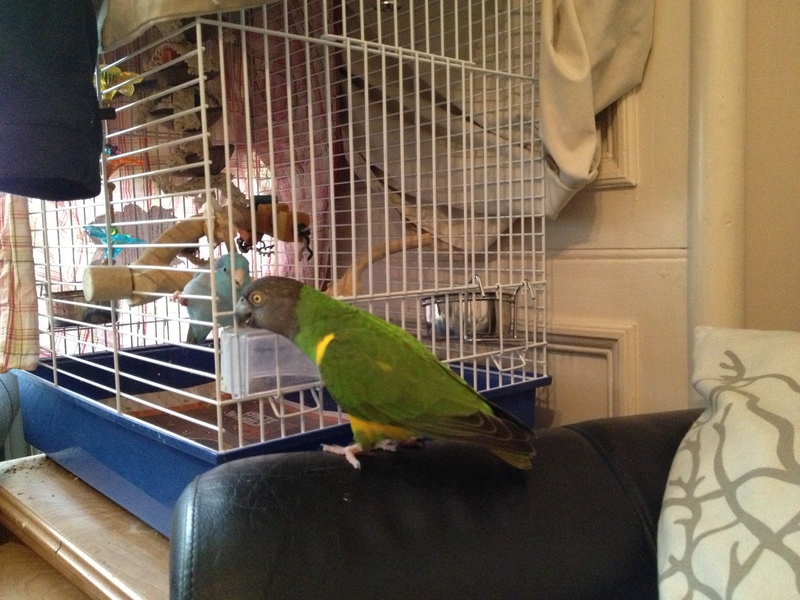 A lot – around £115 per month for a small bird, more for a larger one. There are a lot of costs to consider. The answer to this one has to be no, unfortunately. The cage is the safest place for a bird, while, conversely, the bed is most dangerous. Many birds have been inadvertently rolled on in the night. If you choose not to have your bird sleep in its cage, so long as it stays on a specific perch – and you know it won’t fly around at night – sleeping out is an option. No. Lovebirds do better singly, and canaries will kill each other if housed together. They’re both very territorial birds. 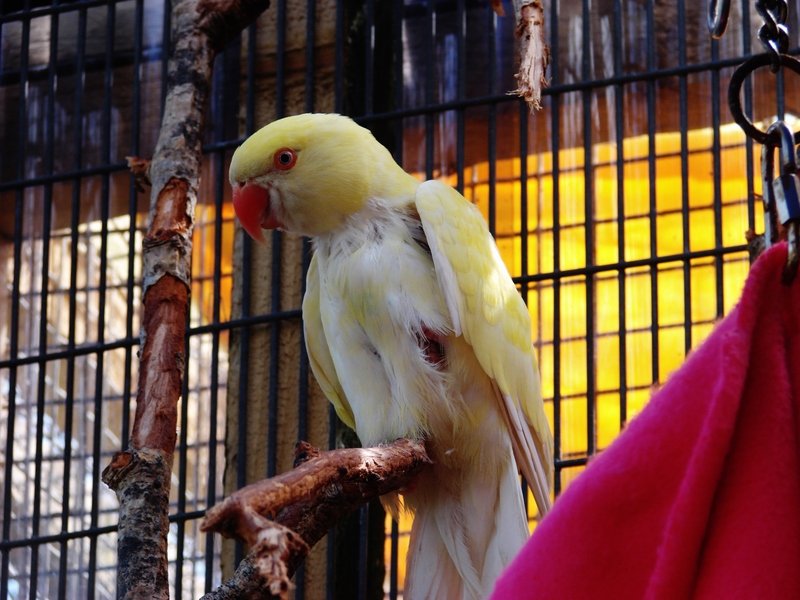 Parrots should generally be given their own cage, and typically don’t require a companion. This one is a big no, unfortunately. Hookbills and finches are very different birds, and parrots tend to be aggressive. Those beaks can slice through a smaller bird. Unless a parrot is already bonded, it’s best to cage them singly. Finches, whilst they do well in groups, are best kept amongst their own species. Yes. I can safely say it does – even if you expect that it won’t, these birds are demanding, and they let you know if they’re not getting enough of something. Parrots require 4 or so hours of your time per day at a minimum. They thrive on more, and don’t do well if they don’t get a lot of one-on-one attention. ‘Not doing well’ includes depression, screaming, biting, and plucking. False! Clipped birds can fly. They don’t even always need a good up-draft of wind – sometimes they manage to soar away in surprising conditions. Clipping a bird’s wings isn’t a good practice anyway, but harness training can allow your pet to explore the outside safely. Photo by Suthatip Sangasophon, taken from the Birdtricks Facebook wall. Yes, many can. Not as well as a Grey, for instance, but their squeaky little robot voices are terribly cute. There are videos of my cobalt celestial, Ptak, chattering away here on this blog, or you can click the link above to watch Koolaid the green parrotlet play peekaboo. At night, yes, covering the cage can comfort the bird and help it establish a bed-time routine. During the day, you can leave half covered, but you don’t want to block out your bird’s light. Doing so can upset the bird and its internal clock, resulting in moults at odd times. Cockatiels are prone to night-frights. Anything can startle a bird at night, from a breeze to a bump, to a sudden noise – this might be the case. Owners of sufferers can help by providing a motion-sensitive night light nearby, or briefly flipping on a light to assist the bird back to its favourite perch. If the issue persists, try changing the sleeping arrangements. It’s possible that there’s in particular that is scaring the bird, like a draught from a vent, or a light outside the window. Birds and children aren’t a great mix. Because they’re so delicate, parrots really need a firm, calm, and gentle handler – and a child can be skittish or over-excited when handling a nippy bird. The sheer energy of many kids will cause your average bird to lash out. These animals are also long-lived and require a serious commitment, so you will quite possibly end up re-homing the animal once your little one either outgrows it or loses interest. Parrots need 4 or so hours of out-of-cage attention, plus make a huge mess and have unique dietary needs. They’re not simple pets at all! Finally, all birds bite, but bigger birds happen to be downright dangerous. Many smaller birds – such as parrotlets or lovebirds – are very nippy and aggressive. Yes, so long as the cages are of a similar size, and the bar spacing is okay. Doing so can even help territoriality. Actually… I have to be honest, unless you’re around the house most of the time, a parrot isn’t an ideal pet for a student. Especially if, once you graduate, you’ll be moving on to full-time work and your bird will be alone for most of the day. As a musician and former music student, my schedule works well with owning parrots, but this isn’t true for many people. This is common in most species – there are exceptions, but a lot of parrots choose a mate from the human flock. It’s just like what they’d do in the wild. Prevent it by ignoring the sexual behaviours of your parrot and learning what triggers them. I debate this question here. Evidence is starting to show that the process of hand-rearing is detrimental to pet parrots. Yes! Flighted birds get the exercise they need and tend to be mentally healthier. 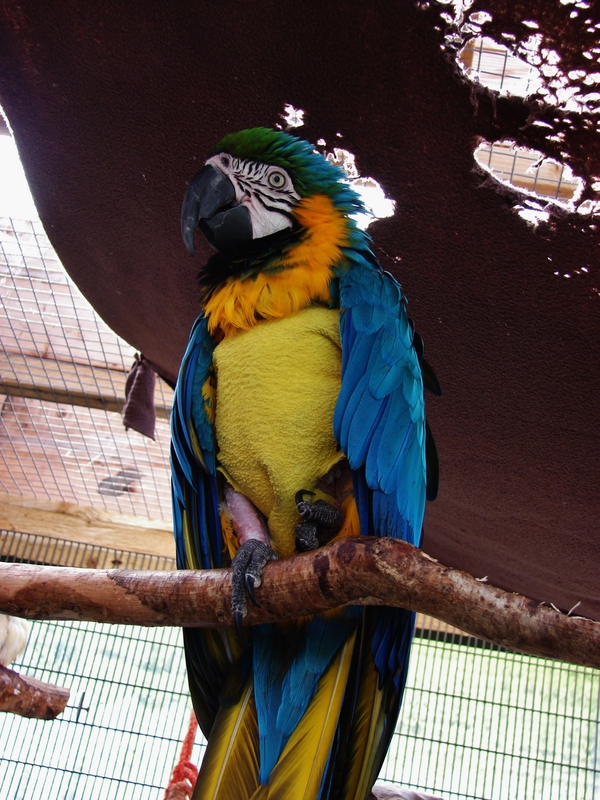 A number of species are prone to fatty liver disease and obesity, such as Amazon parrots, and clipping these animals can exacerbate the issue. I have an article on this blog about the pros and cons of clipping. You do not need to clip your bird to tame it. Doing so can actually hinder the process, as you’ve taken away the ‘flight’ response of fight or flight. No! 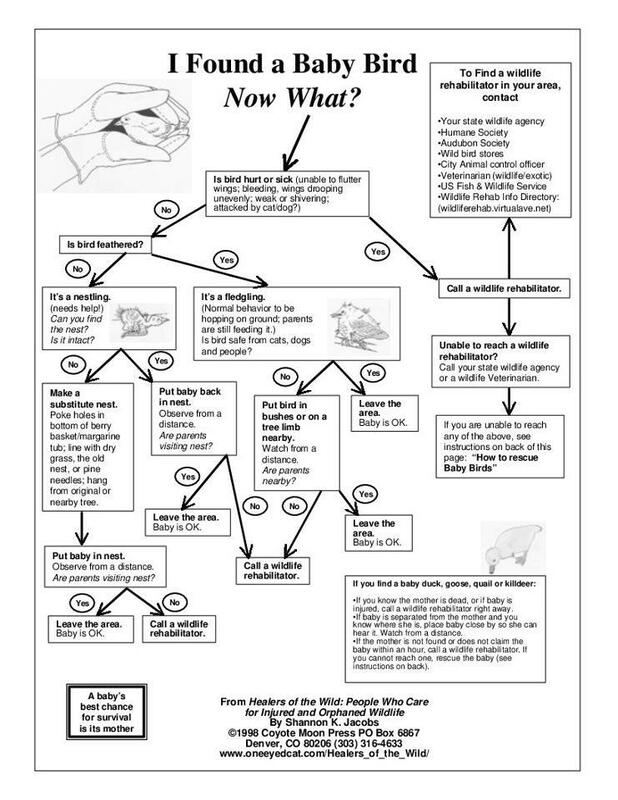 Never medicate a bird without specific instructions from a vet. Human medicines can be very dangerous to birds, since we can’t precisely measure out 1/1000 of the dose a bird could tolerate. Birds should never be given a surprise gift, as they require a serious commitment that an owner needs to prepare for. Not everyone can meet the demands of a parrot, either, so these animals are best adopted with plenty of research done beforehand! If, however, you would like to make a gift of a bird without having it as a surprise, here are a few tips. Popcorn is okay for birds, but the butter, salt, or sugar in microwave packs isn’t, especially the chemicals involved in those flavourings. Instead, try popping your own. There are some pretty nifty instructions here on how to microwave your own. All you’ll need is a brown paper bag and un-popped kernels. Cosy huts and parrot tents have that effect. They are basically perceived as nests, stimulating hormones and breeding behaviours because of the small, enclosed space. Part of those behaviours are defending said perceived nest. Remove it when birdie isn’t looking. I suppose this question is actually fair enough – why not? First, if you’re looking at one, especially for finches, birds tend to stay on one level and not use the areas above or below. This limits them to the middle bit. For any pet bird, a round cage is too small to promote exercise, and it doesn’t leave much room to move around. Longer is better than tall. Finally, birds feel more secure in cages that have corners. They like to retreat into these when they feel threatened. Learn more about cages here. If your bird is not tame, it can take a long time to win its trust. The secret to birds is to let your pet set the pace. Give it its space, ply it with treats so long as it is comfortable with this, and let it adjust. The process may take over 6 months – maybe years – before the bird overcomes its prey instincts and sees you as anything other than a threat. Here’s a game to play with particularly shy birds. Really brilliant to find a site clearly explaining to people the reality that birds and parrots don’t belong in our homes as pets .However, please correct an error regarding Moluccan cockatoos on your site ; these cockatoos are not known in Australia ,they are endemic to Seram, largest island of the Moluccas ,Indonesia. Ah, yes! Very good point – I’ll fix that. And thank you for reading and stopping by to comment! I hope my blog has an impact somewhere in the world – if I help improve one bird’s life, I’m happy. Keep doing what your doing. I’ve shared your article 7 reasons why you shouldn’t have a parret on my grey group. I got a lot of ….lets say a lot agreed and some were darn right negitive. Love what your doing. We need more people to be advocates for our feathered friends. Great blog entry, although I disagree about birds being happier in pairs. 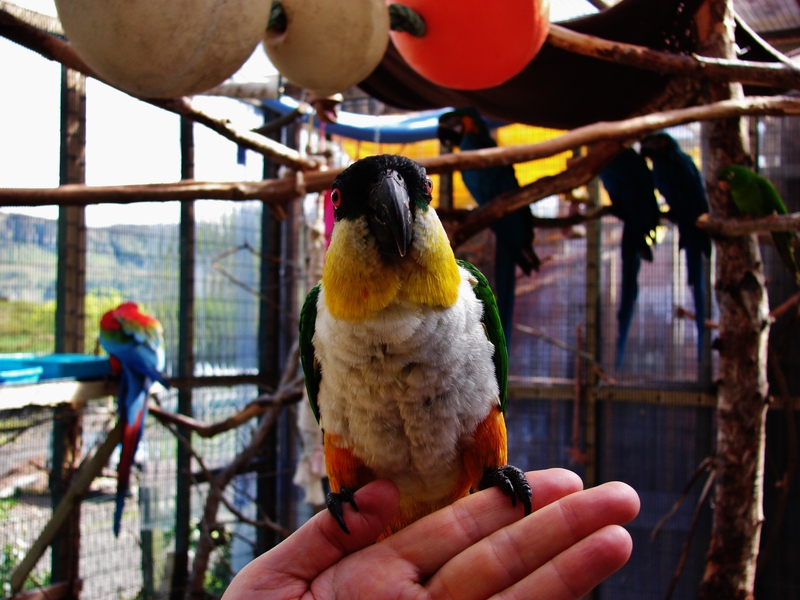 I volunteer at Foster Parrots, a large sanctuary in the Northeast United States and we try our best to integrate birds into flocks within an aviary setting or at least pair them up with a birdie friend. Sometimes it’s not possible with the highly human bonded birds, but many single birds have come in and bonded with another bird well enough to where they now share an aviary or large cage. 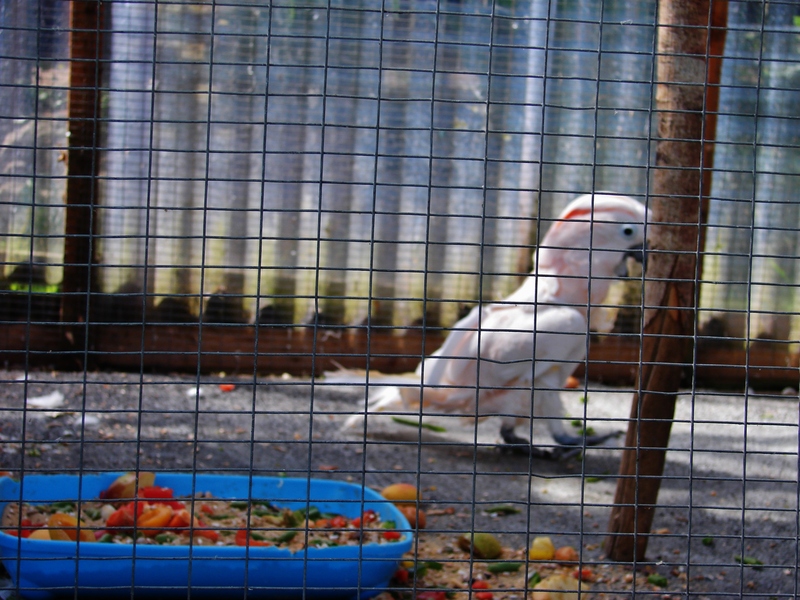 We have a large lovebird aviary and although those birds can be aggressive with each other, almost all of them are paired off with mates and seem very content. We occasionally have to pull a bird that’s not able to keep up with the rest of the flock, but overall I think the birds are happier being with their own kind than alone with only occasional human attention (plus, almost none of the lovebirds want anything to do with humans!) Thanks for doing what you do and educating so many people! Hope you can give me some insight on this question. I’ve had my double yellow head amazon for 26 years now. She is very healthy and I feed her Harrison bird pellets since I got her as a fledging (sp? ), along with some ppl food. She’s never layer any eggs, is this something I should worry about?